As I sort through pictures from our recent trip to Universal Studios in Florida, I am going to occasionally post on portions of that trip. Even if it all comes online a bit out of order. It works, somehow, because images and memories of our time there pop into all of our heads from time to time, and we then all chatter about something funny that happened there and remember whens fly about the dinner table or the minivan. I love those conversations. I also have my own set of private remember whens that only I hold of our time there. I dutifully rode those rides with my family. Several times. And I enjoyed them, I really did. I particularly enjoyed the Harry Potter and the Forbidden Journey ride. Especially the part when the ride shut down unexpectedly when we were riding it. There we were for a few minutes stopped mid ride, locked and loaded into our seats, safely secured, sitting side by side with each other but unable to see each other around the partitions between our seats and our heads held firmly looking forward. This would not be everyone's favorite moment, of course. It would probably be a huge disappointment. But not for me. In the seconds after the ride stopping, I felt Julia reach for my hand and wordlessly lace her fingers through mine. And then she and I quickly began talking about the very cool behind the scenes view we were having into how the visuals and effects of the ride worked, as we sat still for a few minutes before a frozen image on a domed screen before us, legs dangling, feet gently tapping each other's. That was my favorite part of that ride. But my second favorite part of that ride was the lines. Long and slowly moving and snaking through Hogwarts Castle's grounds and halls, before we got to the rides. The detail and eye candy and images from the books brought to life, which came even before I stepped onto a moving floor, lurched right while my body wanted to go left, and got strapped into a moving row of seats. My stomach lurched for hours after, but those lines were just so good. I found the details, the moving portraits, the detail tucked into the rafters, all of it, so enjoyable to look at. Standing in our small circle of family amid crowds of people, looking up and around, pointing and showing each other something new. 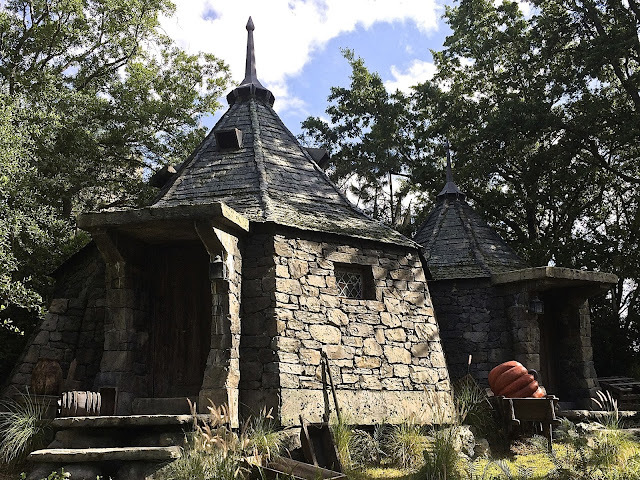 Later in the day, while my family took their 15th ride on the the Flight of the Hippogriff, Elliott's favorite ride in the park, I snapped pictures from the side in a shady nook I had found the day before. I feel this was okay, because at that point I had ridden that ride five times already, which was rather impressive for someone who gets a bit of vertigo when I tip my head upside down and then back right again to put my hair in a pony tail. Again, for me, the best part of that ride? Hagrid's cabin which you walk past while coiling your way through the line. Giant pumpkins and all. As the rest of my family took their first turns and plunges and slipped out of sight, I made my escape, and fast-walked back to the Owl Post we had visited, briefly, earlier. It's hard for the kids to really stand and enjoy the feast for their eyes in the village shops when there are roller coasters just around the next corner. I get that. But alone, I returned and took it all in. I stepped through the doors of the Post and into the adjacent outside area, where I looked up. So very wonderful. And I then pulled from my bag the postcards we had learned we could mail from there and get a special stamp. We mail one postcard to ourselves when on big trips, and this one, with our special owl post stamp, is going to be a favorite when it arrives in our mailbox back home. Postcard owled. And a look at one more delicious window display, and I jogged back to my viewing station next to the rollercoaster. I even made it back in time to catch them as their ride ended. Okay, maybe they had taken two, or three, runs. But they don't seem to have missed me too much. But the magic of these books is there. And for me, it was mostly in the little things, the details, the things you notice from really getting to know a place. Which I realize sounds silly, since we are talking about a theme park here. But I guess it shows how we all get from a place what we need and how we look for what we hope to see. I highly recommend doing this. Do a bit of internet research, spend a bit of time before you fall asleep exhausted each night in your hotel room. Find out about some of the little details and experiences that you can find if you go looking. Ask people who have been there before you. My sister in law sent us this website. Our friends taught us the importance of the right sized lunch bags for the right sized and placed lockers. 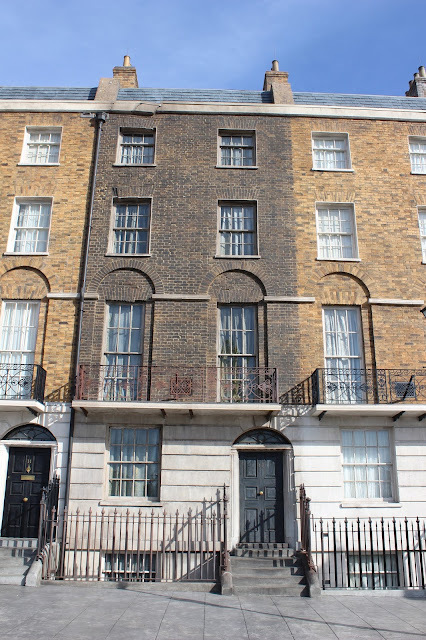 Without these tips, we would have missed moaning Myrtle in the bathroom. 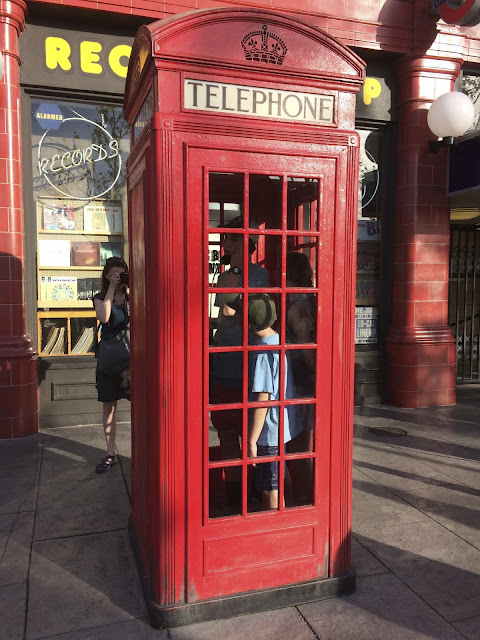 We would not have known the number to dial in the phone booth to reach the Ministry of Magic. We did them all, these recommendations, mostly together. But some I did just for me, and for my unsettled stomach. Or at least I returned when I didn't have someone saying can we go now? The recommended best ice cream in that park, with book character's favorites, also really helped with the stomach issues. Standing in all those lines, surrounded by hundreds, thousands, of other people, turning toward each other and creating our own circle as a family having a lot of fun together. Those lines. I kind of liked them, too.